Peru | it's about argen-time! 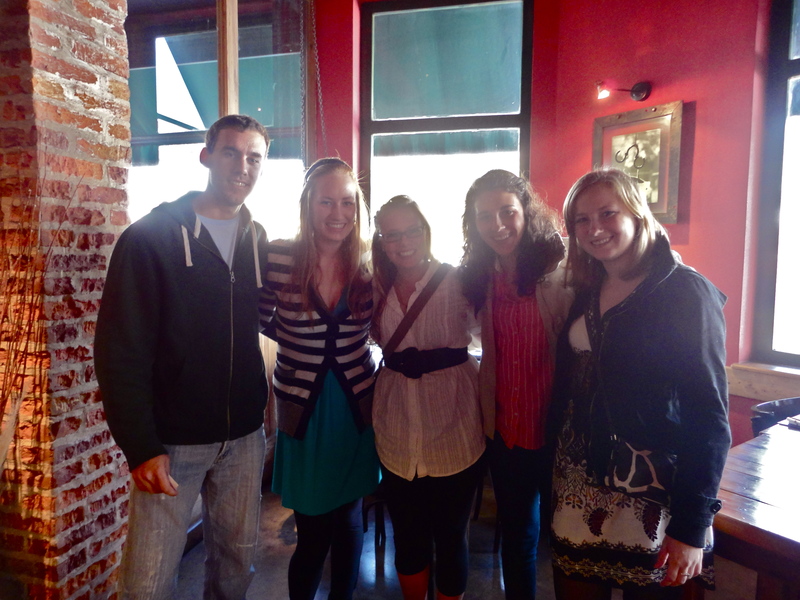 The last of our original group of housemates, Kellie!, recently came back from a 2-week trip through Peru & Bolivia only to leave for good on Tuesday. Of course she wanted the best for her last meal in BsAs, so we went with José & Kellie’s two travel buds, Maddie & Sam, to an Argentine parrilla a few blocks away called La Caballeriza. 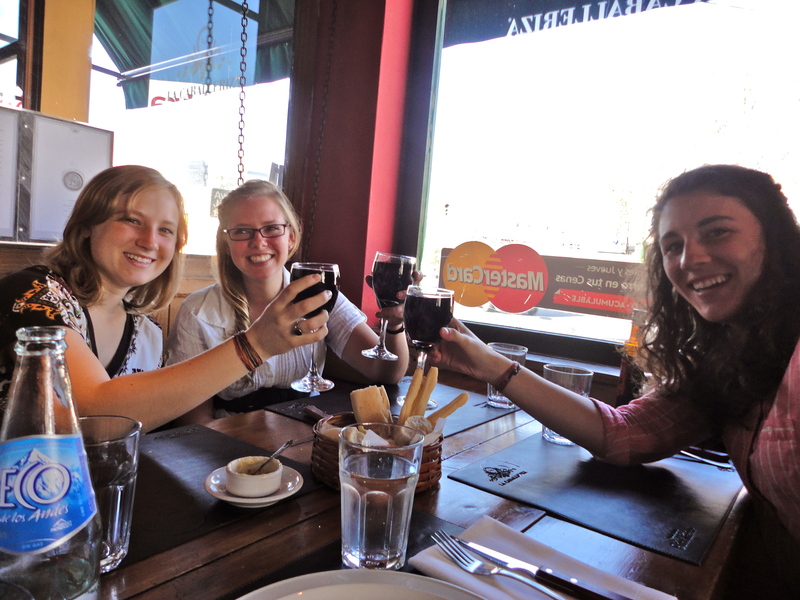 Maddie, Kellie, & Sam toasting to new friends & the best study abroad experience any of us could have expected! The food was great! Our waiter only looked slightly offended when he asked me, “so you don’t eat meat?” after I ordered the grilled veggie platter. It was the perfect way to see our little Kellie off before she got on approximately 10 different planes back to Alaska. It was rough leaving her at the airport; it seems like each goodbye has been worse than the one before it, so I can only imagine what the last one’s going to be like 9 days from now. This morning, a friend told me, “everything is an experience,” which is absolutely true and was especially relevant because we were on our way to school; today being Thursday, I have my one class with Argentine students: publicidad, or advertising. I figure it’s about time I discuss the class because I feel like I learn more about Argentina and the student culture in that 3-hour block than I do the rest of the week. The Argentines actually participate and talk in class. All of them (or close to it). It can be about anything! I just left class after a half-hour debate over brands of jelly. To be fair, there have been much more intellectual conversations had in past classes. My point is that it’s fun, and kind of refreshing, to see how much Latin Americans enjoy talking amongst themselves compared with the usual dead stares & silence that a lot of North American professors face in lectures. Although exciting, the talking can get out of hand. After my class took our break, it seemed to me like I was one of very few people who was actually listening to our professor speak. People were talking amongst themselves, working on a project for the next class, and walking all over the room borrowing tape and glue from each other. I couldn’t believe our professor didn’t recognize what I thought was completely disrespectful! Once class ended, I asked the kid sitting next to me if this happens in every class or if this group is just particularly rowdy. He ended up being Colombian, and he was just as surprised as I was. According to this guy, his professors in Colombia always wear suits & ties, the classes are very structured, and no one speaks out of turn. Maybe I didn’t learn why the Argentine students are so chatty & distracted during lectures, but at least I’m not alone in thinking it’s crazy & kind of rude. There is a class mate. For those who can’t recall, a mate is a hollow gourd that Argentines drink yerba mate (a type of loose tea) out of. On the first day, one of the girls sitting in front of me brought one fully equipped with her thermos of hot water and a bag of yerba. It gets passed, literally, all around the room, professors included. The idea of sharing in this country is heart-warming, yes, but so much more extensive than I’m used to. Speaking of sharing, I’m pretty sure that everyone in that class has the same exact classes together with the only exceptions being me and the other U.S. exchange student. I was a little nervous that I had misinterpreted my professor one day when our class ended (I thought), yet everyone stayed in their seats and didn’t make a move to pack up their things. What I’ve learned from seeing everyone working on their Dirección de Arte projects during our lectures every week is that they stay together in the same classroom and indeed do have basically the same schedules. My class is a first year class, so I’m guessing that they don’t take gen-ed classes like we usually do in our first year or two in college. That’s just a guess, so feel free to correct me if you know otherwise. The students themselves are fun to eavesdrop on. I may not speak very well, but I understand most things. They all seem to be exactly like North American college students but darker & better at Spanish; although, I feel like this advertising class is mixing me in with the more eclectic, artsy crowd. (Advertising is a part of the Department of Architecture, which means that the students who are actually following the plan for advertising majors are taking some seriously artsy classes.) Anyway, I came back from our break to sit & listen to a comparison of how much everyone has been paying for jeans in various countries. There are a lot of students from other Latin American countries in my class (Colombia, Peru, Ecuador, Mexico), so these country comparison chats happen often. For anyone who’s curious, the jeans conversation ended with the conclusion that no one should be paying so much for jeans when they’re just going to class every day. Agreed. There’s more English involved in the Spanish version of advertising than I expected. It seems like my professor is referencing me for an English word at least once per class if not more. His favorite seems to be “techie” (which he pronounces tetch-ee, at times). Whew! That was more than I planned on disclosing, but these are observations that have been building up in my notebook for half of the semester. Speaking of which, midterms are coming up fast. We’ll see if we’ve been sufficiently preparing ourselves or if we’re in for a big surprise!